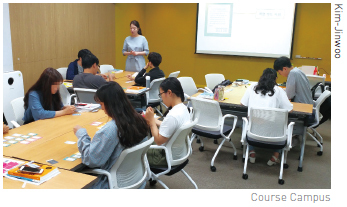 The Employment and Foundation Course Support Center opened a Course Campus lecture in July 2018 at UOS. The Course Campus is for students of UOS to help with preparations they should take when looking for their future job. The lecture was held over four days and each day had interesting information that gives students basic knowledge about how they can get a job. The first day was about students understanding themselves and finding what courses are suitable for them. Students took several diagnose exams to find out their tendencies. If they already know their tendency or want to get a particular job, they did not have to worry about this. They all got two books for understanding several jobs and they could deeply comprehend the jobs that they want to get in the future. Students took a lecture about what kind of mind they need to be leaders on the second day of the Course Campus. In that lecture, “leaders” had a little different meaning. Leaders meant active and creative people. Students learned that trying to be a leader could be advantageous for getting a job. Although being a leader does not guarantee getting a job, it could be a good merit to be a nice person. On the third and fourth day, students learned about several jobs deeply through role-play. A course tutor gave scripts about the lives of those with jobs in various companies and students got a role to play. That role play helped students understand what lives employees are living and gave students clear ideas on how to prepare for the jobs. The Course Campus was held for the first time this year in UOS. The lecture was about what things students should have to prepare for getting jobs. However, the lecture did not only give a comprehension of jobs but also made time for students to understand themselves deeply. Course Campus is going to be held during every vacation of UOS.